Limited edition of just 12,000. Individually numbered. 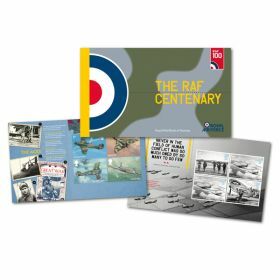 Contains the six aircraft stamps spanning the RAF’s 100-year history together with four coins depicting three of its iconic aircraft as well as the Sea King helicopter. The reverse of the coin is designed by Richard Talbot and Neil Talbot. Obverse features the portait of Her Majesty The Queen by Jody Clark. Edge lettering: Per Ardua ad Astra. The stamps are cancelled with a Cosford, Shifnal postmark. 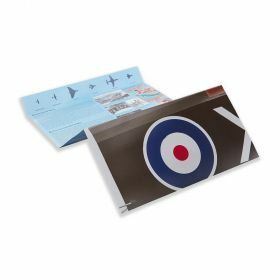 The inside of the pack explains the circumstances behind the creation of the RAF and how it evolved in the inter-war years through innovation and technology. There is also a brief description of the Sea King and aircraft that are depicted on the Royal Mint coins as well as a feature on the RAF100 appeal - a joint venture between the Royal Air Force and four major RAF charities.